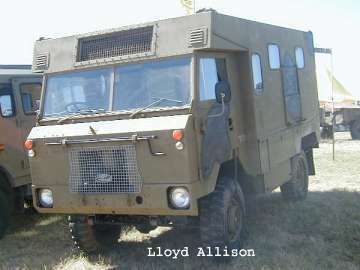 The Land-Rover Forward Control 101 was built for a British Army requirement for an air-transportable heavy duty four wheel drive. The standard 101 is a soft-top although radio vans and ambulances came later. The radio vehicles had 24-volt electrical systems. Many 101s were built in left hand drive for British commitments to NATO in Europe and elsewhere. 1969: Prototype 101s were built. These had a (very) short bonnet and different front panels from the final design. They also used part-time four wheel drive transmission, ENV differentials (as in the SIIB civilian Forward Control Land-Rover) and a 3-litre 6-cylinder Rover engine. It is possible that an LT95 transmission without a centre differential may have been fitted. A powered trailer could be driven, but only in low ratio. At least one 101 prototype was brought to Australia for trials and fitted with an Australian Ford Falcon 3.6-litre 6-cylinder motor. This prototype, and its powered trailer, were used by a Tasmanian mining company. It was later bought by John Ayre and Simon Ramsey of ULR Motors in Melbourne. At this time it still had the original tray body with canvas tilt (soft top). The Falcon motor was replaced by a 4.4-litre Leyland Terrier V8. The Terrier was a truck version of that V8 which has served Rover well. A more highly tuned 4.4-litre V8 was also used in the Leyland P76 sedan. 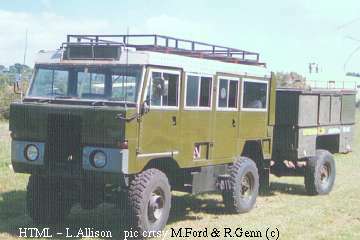 P76 and Terrier V8s were popular transplants into SIII Land-Rovers in the 1970s and 1980s. 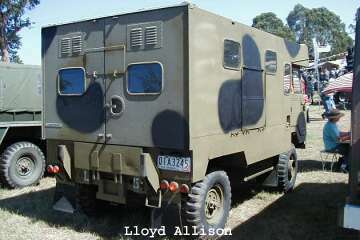 At some time an outback tour bus body was fitted and the 101 used by Korragabba Adventure Tours. The vehicle is currently fitted with a 350 Chev and the ENV differentials have been replaced with Salisburys. Powered trailer capability (prototype in lo ratio only). The prototype was fitted with a `phase-I box' and ENV axles. The production models were to get the `SIII phase-II gearbox' (ie. LT95) and Borg Warner, Rover phase III (sic) or ENV axles. brakes 280mm × 76mm (11" × 3") front drums, 280mm × 63mm (11" × 2.25") rear drums. A split hydraulic system with twin Clayton Dewandre HSD 770 servos was fitted. 1972: The production 101 design was revealed. The 101 was produced between 1975 and 1978 although many vehicles were stored for long periods and others were refurbished at later dates. The Land-Rover 101 uses the 3.5-litre alloy V8 and LT95 transmission from the Range Rover. This gives a 4-speed gearbox × 2-speed transfer case, and full-time 4WD. Suspension is by leaf springs - slightly unusual in having just two large leaves at each corner. Axles are longer than in "series" Land-Rovers, with 2× Salisbury differentials, and welded, non-removable steering swivel housings. Standard tyres are 9.00"×16" on 6.5"×16" wheels. The wheels have six wheel studs, not five as in other Land-Rovers. transmission LT95, 4-speed manual, 2-speed transfer-case, full-time 4WD, centre differential, axle differential ratio 5.4:1. 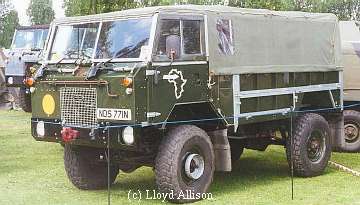 A few 101s were fitted with a "hot-shift" PTO for driving a Rubbery Owen powered trailer, making a 6×6. The production run ran until 1978 and all supposed later models were only returned to Land Rover in 1980-1982 for a factory rebuild. 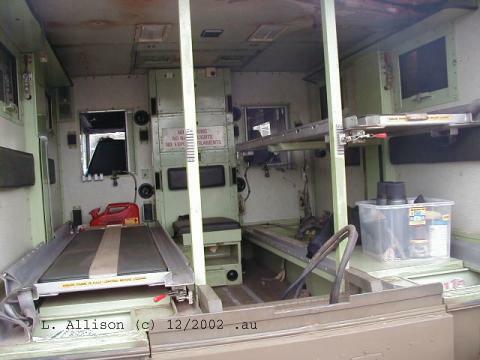 The Ambulance bodies were added later to the standard chassis. The powered trailer never went into production following some kind of hitch on the trials. Not all variants had the winches fitted though most RAF vehicles had one. The production run was approx 60% 24V and 40% 12V with a larger number of LHD vehicles being produced than RHD in both voltages. This was due to the large commitment of the Army to Europe especially Germany. Interestingly a choice of colours was also available. The Land-Rover 101 and Rubery Owen powered trailer make a six wheel drive combination. 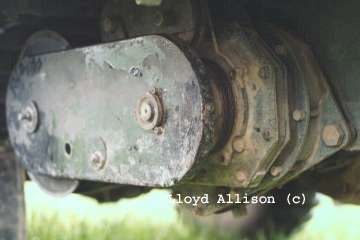 The trailer has a Land-Rover axle complete with differential. The 101 uses the LT95 transmission with full time four wheel drive and centre differential as found in the original Range Rover. The LT95 was designed with the 101 and powered trailer in mind and permits the use of a "hot shift" power take off (PTO): this PTO rotates at the same speed as the prop-shafts regardless of whether high-range or low-range is selected. The trailer therefore does not need its own transfer case. Although it shares the same axis as the main gearbox output shaft, the trailer PTO is instead driven by the (constant mesh) low-speed cog on the transfer case intermediate shaft. In this way it revolves at same speed as the 4x4's propeller shafts in both low-ratio and high-ratio. A second PTO unit can be fitted below the LT95 to drive the optional Nokken winch (see later). The tow point is mounted in the centre of the 101's rear chassis cross member. A conventional army style tow hook can be fitted for use with ordinary trailers and other army vehicles. The tow hook is attached by the chain which carries teeth to latch over a flange on the chassis cross member and another on the hook thus clamping them together. Releasing the wing nut allows the chain to be unwrapped to detach the tow hook and its flange. Removing the conventional tow hook reveals the power take off drive. Inside this socket is a splined drive shaft which supplies the power, taken from the transfer case PTO unit via a propeller shaft, to the Rubery Owen trailer. Forces between the 101 prime mover and the trailer, which can of course include both pushing and pulling, are transmitted through a flange on the trailer coupling which is locked in place by the chain mentioned before. The powered trailer cannot use any ordinary tow bar, instead it carries a fitting to lock into the power take off drive socket. The trailer's drive shaft passes down the centre of this fitting which must articulate relative to the trailer. A yoke on the trailer allows 60 degrees of movement in pitch and yaw and 360 degrees in roll (not recommended). 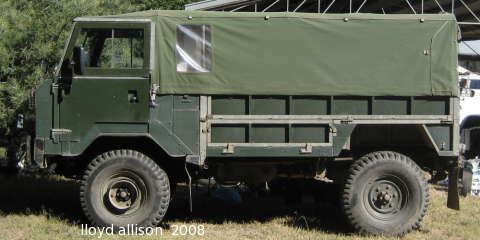 Land-Rover conducted various experiments with powered trailers using simpler, more conventional tow bars which had more restricted movements but they were felt to be insufficiently "soldier proof". The drive shaft must contain one or more joints to allow for changes in angularity between the 101 and the trailer. 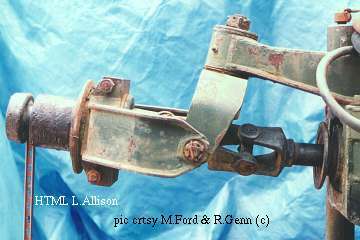 Twin universal joints are used. Taken together, these effectively form a constant velocity joint which would be important at large angles of deflection or high speeds. This arrangement also allows for some "play" in the tow bar yoke. The 101 with trailer forms an articulated six wheel drive (6WD) which has some advantages over a rigid one. It is almost impossible for the unit to get "cross axled". In fact the trailer almost always has its full weight sitting on its wheels regardless of terrain and is most unlikely to loose traction. In comparison, a four wheel drive that happens to get supported on diagonally opposite wheels can loose traction, unless axle diff' locks are fitted, because one wheel on each axle is unweighted. The Nokken is a Norwegian winch normally used in forestry, and manufactured by Hordaland Mek. Approximately 20% of the 101 vehicles, except ambulances, were fitted with these winches as far as I know. This winch is more versatile than others. The cable can be lead to the front or rear of the vehicle. With a cable length of 65 metres, it is twice as long as normally found on an electric drum winch. Winching speed is variable, depending on gearbox, transfer gear and throttle settings. Being a capstan winch, the cable load is constant, unlike an electric drum winch which is dependent upon how much cable is on the drum and upon the state of the battery. A minimum of 5 wraps of cable on the take up drum should be maintained when winching. Mark the cable with paint or plastic tape so that it can be seen from the driver's seat. Initial winch load can exceed that to which the winch was originally set due to corrosion, temperature etc. This winch should not be used for lifting. Legal requirements apply in this situation. Cable should be checked prior to load setting and any use. Replace it if there are any signs of damage, wear or corrosion. The cable should be cleaned, checked and re-greased prior to load setting and any trip where winching may be required. Use EP90 gear oil to lubricate winch moving parts. Two people are required. Connect a load cell or strain gauge to a sturdy tree via a strap or chain. The instrument's scale must exceed the requirements (2200kgf). The winch cable from the vehicle is connected to the load cell. The person reading the load cell should be protected by another vehicle or heavy barrier. The person adjusting the winch clutch will be protected by that vehicle. Operate the winch as described in the Military User Handbook, optional equipment section page number 173--, to release approximately 75% of the cable. Select first or second gear. Use the vehicle brakes to slowly increase the vehicle load until the winch clutch slips (vehicle stationary). A jerking motion indicates the winch clutch is slipping. If the load reading on the load cell exceeds 2200 kilograms, stop winching and reduce the clutch load. If the load reading fails to reach the 2200 kilogram mark, stop winching and increase the clutch load. This is adjusted by rotating the adjusting nut (lock-nut on storage drum shaft). Clockwise to tighten and increase the load. Anti-clockwise to loosen and decrease the load. Note the adjustment in the critical area can be rapid! Only adjust the nut one flat at a time. Land-Rover built prototypes of a "civilised" 101, the Llama, c1985-1986 but it did not go into production. Thanks to Michael Bishop, Mike Ford, Rod Genn and others.